Ellen Degeneres’ interview/hangout with Hillary Clinton is set to air Monday afternoon, and from the brief teasers we’ve been given so far, it is evident that Clinton has been dutifully pursuing her M.S. in millennial culture. In one clip released Friday, Clinton plays “Heads Up,” a charades-like guessing game that I’ve never heard of before, with Degeneres and her potential television predecessor, President Fitzgerald Grant (Tony Goldwyn). 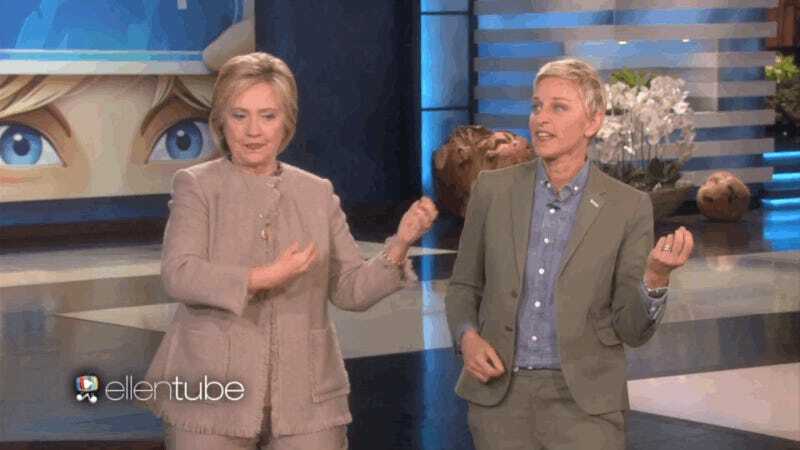 During the segment, Clinton and Degeneres are tasked with acting out little phrases like “patty cake,” and “aerobics class,” and “photobomb.” Clinton’s odd little attempts at miming are as sweet as they are unsettling. I won’t soon forget her little fingers plucking an air guitar. Another clip released Monday morning, aptly entitled “Hillary Clinton Talks Hot Topics,” shows Degeneres all but endorsing Clinton, before asking her about Kim Kardashian’s selfie technique. “She takes out her phone, and she presses a button... she holds it up, it has light all the way around it. Like little tiny, tiny light bulbs,” Clinton says of her experience taking photos with the queen. So, how are we feeling about her immigration plan?